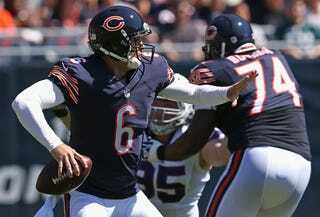 Sunday's box score shows that Jay Cutler threw two interceptions and his team lost to the Bills. What it doesn't show is just how much of a nightmare Cutler inflicted on his team's chances. According to data from Brian Burke of Advanced Football Analytics, Cutler was responsible for three of the top six most detrimental plays in the NFL on Sunday. Up front, Win Probability is based on a variety of things, like time remaining, score, down, distance, and so on. So for something like Tony Romo dousing himself in gasoline and leaping into a volcano, the effect is diminished if his team is already down by 50. WP isn't perfect, and in small chunks (and in the wrong hands) it can do some downright silly things. But Brian Burke is one of the smartest dudes in football, and his Win Probability is more or less the industry standard. We have tables for all the worst (and, sure, best) plays of the week according to WP below. As for Cutler, his interception in the middle of the fourth quarter was the worst, and lowered the Bears' Win Probability by 36 percent. The pick in Buffalo territory later led to a Bills field goal. The next worse was an incomplete pass intended for Santonio Holmes on third-and-one near the end of regulation; it lowered the Bears' Win Probability by 27 percent. While the Bears kicked a field goal to send the game into overtime on that possession, converting the third down would have keep a drive alive deep in Buffalo territory where a resulting touchdown would have likely sealed the deal. The other disastrous play Cutler was responsible for was his interception in the second quarter that Corey Graham returned for 45 yards to the Chicago 15 yard line, which resulted in a Bills touchdown one play later. That play lowered the Bears' Win Probability 21 percent. Cutler also accounted for one of the most useful plays of the week, a little nine-yard completion to Matt Forte late in the fourth, but that's less fun to rehash. So here now are the most and least helpful plays of the week.